4×4 vehicles are designed to be used in testing conditions, often in stressful and demanding situations. Our off-road training is aimed at giving your drivers the skills they will need to assess routes for safety, taking into account the capabilities and limitations of their vehicle. 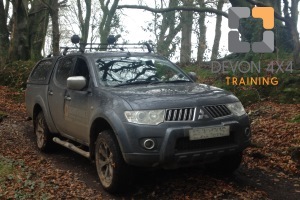 4x4 training can be delivered at various sites across Devon and the south west and, with our colleagues, across the whole of the UK. From short courses introducing experienced drivers to the off-road characteristics of new vehicles, to longer Lantra-Awards 4x4 courses covering driving techniques for novices and advanced training for those expected to work in the most testing terrain, we ensure that drivers are clear about exactly what the vehicles can do and, more importantly, what the vehicles should be expected to do within a workplace environment. Working with your briefing, to clear criteria and completed with full driver reports upon completion, we believe our training courses are the most efficient solution to any company’s off-road training requirement. Our experienced trainers have an extensive background in off-road driving, from winning UK trials competitions to training 4x4 drivers across the unsurfaced tracks and deserts of Africa.